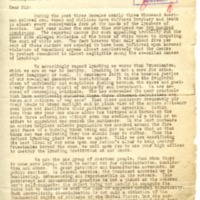 Writing to the Attorney General of the U.S. asking that he help stop lynching in the U.S.
During the past three decades nearly three thousand American colored men, women and children have suffered butchery and death in almost every conceivable form at the hands of the lynchers of America. Last year alone the number thus murdered was two hundred twenty-two. The reported causes for such appalling brutality run the gamut from alleged violation of the honor of white women to disputing the word of white men. The fact however that only about five per cent of these murders are reputed to have been inflicted upon accused violators of womanhood argues almost conclusively that the desire to protect womanhood is almost negligible among the so-called causes of lynchings. We accordingly regard lynching as worse than Prussianism, which we are at war to destroy. Lynching is not a cure for crime, either imaginary or real. It decreases faith in the boasted justice of our so-called democratic institutions. It widens the frightful chasm of unfriendly and suspicious feeling between the races and positively foments the spirit of antipathy and resentment. We are accused of concealing criminals. Who has concealed the many criminals that have mercilessly murdered these three thousand defenseless men, women and children of our race? That these murderers frequently ply their trade in broad daylight and in plain view of the entire citizenry even does not facilitate their punishment or detection. Within less than one year one state alone has tortured and burned at the stake three colored men without even the semblance of a trial or an effort to apprehend and punish the murderers. In the last instance an entire helpless colored population was marched around the fire amid fumes of a burning human being and put on notice that as that black man was suffering they too should fear to suffer. Thus the defiant lynching giant strides on apace. While we are sacrificing the best blood of our sons upon our nation's altar to help destroy Prussianism beyond the seas, we call upon you to use your high offices to destroy the lynching institution at our doors. We are the one group of American people, than whom there is none more loyal, which is marked out for discrimination, humiliation, and abuse. In great patriotic and humanitarian movements, in public carriers, in federal service, the treatment accorded us is humiliating, dehumanizing and reprehensible in the extreme. This persistent and unreasonable practice is but a thrust at the colored man's self-respect-- the object being not merely to separate the races but to impress us with the idea of supposed natural inferiority. Such demoralizing discrimination is not only a violation of the fundamental rights of citizens of the United States, but the persistent segregation of any element of our country's population into a separate and distinct group on the sole basis of color is creating a condition under which this nation cannot long endure. When we reflect upon these brutalities and indignities we remember they are due to the fact that in almost every southern state we have systematically, by law or chicanery, been deprived of the right of that very manhood suffrage which genuine democracy would guarantee to every citizen in the republic. This prop______ of filching from colored Americans the ballot is but a supreme effort to re-enslave us and to force our assent to, and our impotence against, any legislation of our opponents. To this policy the black man does not, cannot and will not agree. Of it, our intolerance is cumulative. Against it, we shall exert our righteous efforts until not only every eligible black man but every eligible black woman shall be wielding the ballot proudly in defense of our liberties and our homes. We are appealing to you neither as vassals nor as inferiors. Bull Run and Appomattox fixed our status in this nation. We are free men. We are sovereign American citizens-- freemen who have purchased with our own blood on every battle field from Bunker Hill to Carrizal full rights and immunities such as are freely granted others but systematically refused us. We are writing you, gentlemen, that you may give us the assurance and guarantee which every American citizen ought to have without reference to color. We are loyal and will remain so, but we are not blind. We cannot help seeing that white soldiers who massacred our black brothers and sisters in East St. Louis have gone scot free. We cannot help seeing that our black brothers who massacred white citizens in Houston have paid the most ignominious penalty that can come in their country to a man in uniform. Do not these undemocratic conditions, these inhumanities, these brutalities and savageries provoke the Rulers of the nation to speak out of their long sphinxlike silence and utter a voice of hope, a word of promise for the black man? Do the rulers of the nation also hate us, and will they, Pilate-like, forever give their assent to the crucifixion of the bodies, minds and souls of those in whom there has been found nothing worthy of the death we are dying save that we are black. May not your silence be construed as tacit approval or active tolerance of these things? The effect on the morale of black men in the trenches, when they reflect that they are fighting on foreign fields in behalf of their nation for those very rights and privileges which they themselves are denied at home, might be discouraging. We appeal to you in the name of democracy! We appeal to you in the name of our American citizenship! Bryant, P. J., “PJ Bryant, et. al. to Attorney General Thomas W. Gregory,” 1918 March 5, L030518, Race and Segregation Collection, Woodrow Wilson Presidential Library & Museum, Staunton, Virginia.